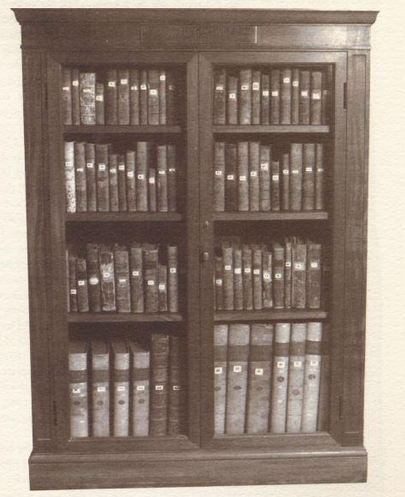 The collection of books donated by Franklin were housed in this standalone bookcase from 1904 till 2018. The library at Franklin, Massachusetts has an intimate connection with Dr. Franklin, and is re-housing their collection of books he donated. They were displayed in a standalone, closed bookcase from 1904 till now (2018), when they are going to a more accessible presentation, according to this news report on the renovation. Congratulations! Dr. Franklin asked Dr. Richard Price, a Unitarian minister in London, to select books. In wondering about the many religious volumes, I at first supposed Dr. Price’s occupation as well as Dr. Price realizing the town was built around a Congregational church. On further reading, this idea of books on religion seems to have come from Franklin himself: he asked for books as are most proper to inculcate Principles of sound Religion and just Government. Mr. Williams has given me much pleasure by calling upon me and bringing me a letter from you. I have, according to your desire, furnish’d him with a list of Such books on religion and government as I think Some of the best, and added a present to the parish that is to bear your name of Such of my own publications as I think may not be unsuitable. Should this be the commencement of parochial libraries in the States it will do great good. We only regret, that Modesty should deny us the celebrated Productions of the greatest Phylosopher and Politician in America. Since Providence hitherto hath delighted to smile on all your great and noble Efforts, we cannot but hope, your generous exertion to diffuse useful and divine Knowledge among us, will be productive of the happiest effects, and completely answer your warmest wishes. May all the seeds of Science, which You have sown in this, and various other parts of the world, grow up into a living Laurel, to adorn your illustrious Head in the Temple of Fame. Vicky Buchanio, librarian of the Franklin Public Library, has graciously shared information about the books. There is a nice view of this beautiful facility on this TV news report. Edwin Wolf and Kevin J. Hayes, The Library of Benjamin Franklin (APS, 2006) on Google Books. Edwin Wolf’s lifetime study of Franklin’s books culminated in this APS publication. Library Thing: Member: Benjamin Franklin I’m not sure I fully understand this site, but it appears to be a fabulous digital collection of information about Franklin’s Books.